I was in the San Luis Obispo area for my nephew's graduation this afternoon. Always looking for an angle to get some hiking in, I had two hikes in mind for the morning that would take in a couple of summits I've had my eye on for years now. Temperatures in the area were expected to be quite high despite the proximity of the Pacific Ocean and it would be good get these done earlier rather than later. Mt. Lospe is a P1K on the edge of Vandenberg AFB in the northwest corner of Santa Barbara County. There are a couple of dirt roads leading to the summit, both originating within the military complex. I had hoped that a friend with ties to the Air Force might help me gain access somehow, but so far all my inquiries to date had come to naught. In one of my map studies a few months ago I noticed there is a Point Sal State Beach at the upper corner of the AFB property. The Point Sal Road has been converted to the Point Sal Trail, allowing access to the state park with an easement through the NW corner of the AFB. This trail happens to go within a mile and half of Mt. Lospe which lies on ranch property. I spent the night camped at the end of Brown Rd where the trail starts and also the entrance to one of the active ranches. I intended to get up early and start hiking before sunrise but the sun was already up when I started off shortly before 6a. It took about half an hour to reach the 1.5mi mark where I turned off from the main trail and started across open, grass slopes towards Mt. Lopse. Point Sal Ridge is an LoJ summit more or less along the way that I went over. From its rounded summit one can see Mt. Lospe another mile and a half away, looking rather flat. The boundary of the AFB has been bulldozed to make a very wide firebreak - whether that is to prevent fires from burning onto AFB property or the other way around is hard to discern, but the firebreak made a convenient trail to follow up and over several intermediate rises. It took a little over an hour to reach the summit, or at least what seemed like the summit and matched the LoJ GPS coordinates. The flatness of the summit prevents it from having really good views as did the sun which washed out views towards the east. I returned much the same way, checking out several other possible highpoints along the way. I saw no activity on the base or the adjacent ranch lands, but the Point Sal Trail proved to be quite popular in the morning as a workout run and later for those making the 10-mile roundtrip effort to spend the day at the beach. There were more than half a dozen cars at the TH when I returned soon after 8a and it had warmed to 77F already - it was going to be a hot one today. This is one of the Seven (or Nine, or Thirteen, depending on who's counting) Morros between Morro Bay and San Luis Obispo, and a CC-listed summit. I had visited most of the other morros over the years, but had missed this one because of restricted access. 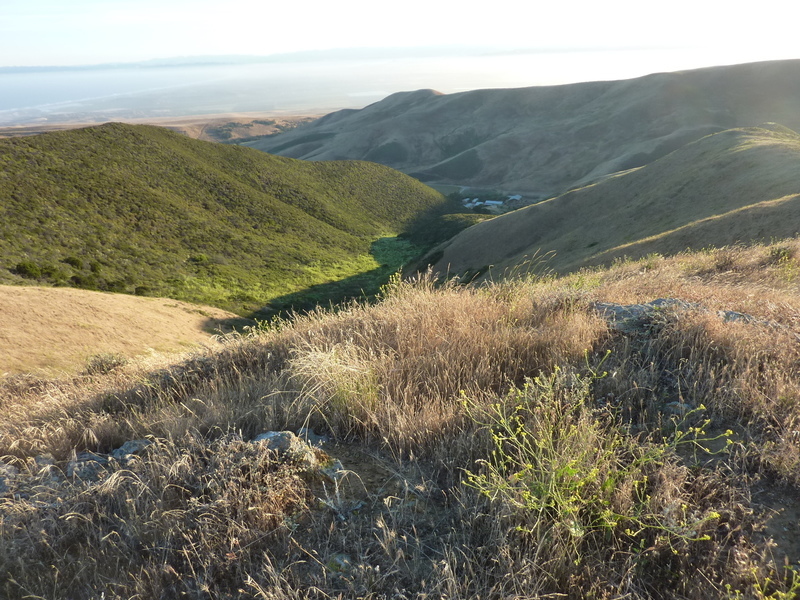 There is a trail switchbacking up the north side on Camp San Luis Obispo property, owned by the California National Guard. Various reports have said the public is not welcome, welcome with permission or merely at the whim of the acting commandant. Ranches occupy lands on the east and south sides with heavy brush a considerable impediment from those directions. There is a monastary on the west side that Sean Casserly had reported using successfully, and it was this version I decided to repeat.